Our new article Hotel geopolitics: a research agenda has just been published in the journal Geopolitics. Its genesis lies in the session Hotels: political geographical investigations that Sara organised with Klaus Dodds at the 2010 RGS-IBG annual conference (full session details in the downloadable conference booklet). Sara then developed the research into hotels with a British Academy-funded project and affiliated website and art exhibition on the histories of cosmopolitanism and conflict in the former hotel district of Beirut. The new article, linking Adam’s previous research on political geographies of hospitality to Sara’s work on hotels (there is also a related Facebook page), sets the agenda for studying hotels as geopolitical sites. Further work on specific hotels case studies stemming from the same RGS-IBG conference session has been published by Ruth Craggs, Uma Kothari and by Lisa Smirl. This article is dedicated to Lisa’s memory. 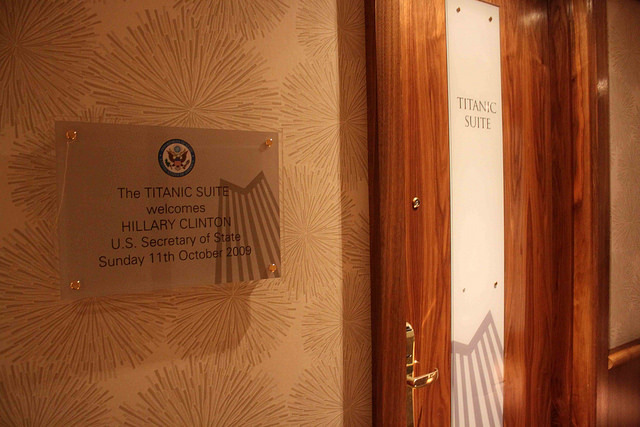 Europa Hotel Belfast – The Clinton Suite. Source: Navjot Singh, February 19, 2013. http://www.navjot-singh.com Under creative commons license. Alex Jeffrey reflects on the day he spent at the PolGRG workshop in Birmingham, with insights from yesterday’s presentations. I have spent the day at the Political Geography Research Group Workshop at the University of Birmingham, organised by Adam Ramadan and Sara Fregonese. This is an (almost) annual event bringing together postgraduates, post-docs and lecturers to think about current research and teaching in the field of political geography. This year the workshop was titled ‘Regenerating Political Geography’ and was focusing on emerging research strands while also giving the requisite tools to a new generation of political geographers to embark on the next stage of their career. I was sorry to miss the second day (where Alan Ingram and Fiona McConnell were talking on teaching, while Jason Dittmer and Sara Fregonese gave presentations on the job market). Transit space – creative space? ‘This is not France, this is the Jungle’: initial reflections from ongoing research in the new refugee camp in Calais. Ceremonies of possession: performing science and sovereignty in the Canadian Arctic. The Political Geography Research Group is holding a two-day workshop on Wednesday 24 and Thursday 25 June 2015 at the University of Birmingham. The theme is ‘Regenerating Political Geography’, and will hold a dual focus on new and emerging research directions that regenerate the sub-discipline, and career progression for postgraduate and early career scholars who will be the next generation of political geographers. Recently two reviews of my book with Ralf Brand “The Radicals’ City: Urban Environment, Polarisation, Cohesion” were published. The first, brief one appeared in Urban Design, Issue 129, Winter 2014. The other, more thorough, was published on the Arab Studies Institute e-zine Jadaliyya. The Jadaliyya review, authored by Jihad Farah, is very engaging and thought-provoking as it tries to pinpoint the role of urban design within the situation in those Middle Eastern cities that are experiencing socio-political transition as well as division, waves of radicalisation and outright violence. Jihad Farah’s only critique to the book is that the case studies are descriptive and lacking some depth, including treating the groups studied as organic entities rather than highlighting their nuances. This critique is not suprising. Although based on 100+ interviews as well as data elicited through participatory photography, the original project at the basis of the book was – for its nature and duration – broad and to a certain extent exploratory, rather than ethnographically specific and in-depth. Through 4 intense but brief fieldwork sessions of 2 weeks in each city, our goal was to identify urban dynamics connected to dynamics of polarisation and radicalization that are transferable to different contexts and – most importantly – relevant to different audiences. Jihad Farah’s piece is a very good read for those who are trying to make sense of the ongoing Middle Eastern situation not only from a political perspective, but also – very importantly – from a spatial one. A recent snowstorm in the Bekaa Valley, in eastern Lebanon, drew the world’s attention to the desperate plight of the 2 million refugees from the Syrian civil war. Images of refugees trudging through snow in plastic flip-flops and summer clothes, and burning plastic mats to keep warm, highlighted the urgency of this humanitarian crisis. Refugee crises are not a new experience for Lebanon, and the country’s experiences with Palestinian refugees have shaped the response to this new crisis. In the first Arab-Israeli war of 1948, when the state of Israel came into being, around 750,000 Arab residents of Palestine became refugees. 100,000 of these came to Lebanon, where they have survived in refugee camps ever since. With subsequent generations inheriting refugee status, there are now more than 440,000 Palestinian refugees registered with the United Nations Relief and Works Agency in Lebanon. This represents around 10% of the entire population of Lebanon. Exile has been a difficult experience for Palestinian refugees and for Lebanon itself. With its diverse population of 18 recognised religious groups, bound together by a confessional political system that divides power along sectarian lines, Lebanon was ill prepared for this influx of mostly Sunni Muslim Palestinians. Marginalising Palestinians in refugee camps, and resisting all forms of integration and normalisation, has been the state’s response to this challenge. At the same time, the Palestinian refugee camps gained autonomy from the state in 1969. From 1970, Lebanon became the terrain for the PLO’s war of national liberation against Israel. Between 1975 and 1990, the country was torn apart by civil war, in which Palestinian armed groups were heavily involved. Since the war ended, the Palestinian camps have remained uncontrolled zones, referred to as ‘security islands’ by many Lebanese. It is into this fraught context that around a million Syrian refugees, fleeing the catastrophic war in their country, have sought refuge. Of these, 778,136 are registered with UNHCR. The experiences of the earlier Palestinian refugee crisis are shaping the Lebanese response to the Syrian one. The government has refused to set up official camps, seeking to house refugees instead in rented accommodation or with local families and communities. Many ordinary Lebanese have stepped in to offer emergency assistance and hospitality, in the absence of government and non-governmental organisations. Others have been far more hostile: earlier this month, residents of a village in eastern Lebanon burned down a makeshift Syrian refugee camp, on the pretext that a Syrian had raped a disabled Lebanese man. Lebanon risks being torn apart by the Syrian war. Many Lebanese support the Syrian government, while many support factions among the armed opposition; Lebanese of different religious communities are crossing the border to fight on each side in the Syrian war. Now more than 1 in 4 people in Lebanon are refugees – Syrians, Palestinians, and Palestinian refugees originally registered in Syria. More than half of all registered Syrian refugees – more than 1.1 million – are children, and three quarters of these are under 12. A recent UNHCR report highlighted their plight. With more than half not in school, “a generation is growing up without a formal education”. Many are having to work; many others are isolated and confined to their places of shelter. Thousands are unaccompanied, separated from their parents or orphaned. Three quarters of babies born in exile have no birth certificates. The huge strain of the Syrian refugee crisis is falling on the people and governments of neighbouring states like Lebanon. 17 more countries, most in Europe, have now agreed with the UNHCR to resettle Syrian refugees, but the numbers to be resettled are tiny compared with the scale of the problem – equivalent to the number of new refugees every two days. The UK government has pledged £500 million in aid to those affected by the Syrian conflict, including £66 million in Lebanon, but so far refuses to participate in the resettlement programme. Refugee charities have called on the UK government to extend their humanitarian response and institute a programme of emergency humanitarian evacuations for refugees in most need. 75 years ago, in November 1938, Britain waived immigration restrictions to give refuge to around 10,000 unaccompanied children – most of them Jewish – from mainland Europe. No doubt many would have died, had they been left to their fate under the Nazis. Why is such a humanitarian gesture so unthinkable today? Is popular opposition to immigration so powerful that the collective political will of the world’s richest continent can do no better than resettling 12,000 refugees? Is Britain’s proud history of giving sanctuary to those facing oppression and violence now simply that: history? 75 years since the Kindertransports, a million Syrian children now face another winter in tents and improvised shelters, away from home. The world surely must do better. While I wait for some reviews of the new book to come out, last week the independent ezine Jadaliyya – run by the Arab Studies Institute – published an interview about The Radicals’ City. It contains a few insights about the book, about its connections to my current research, as well as an excerpt from the Belfast case. It was a nice opportunity to contribute to the “Cities” page of Jadaliyya, which – quoting from their website – is “promoting critical understandings and investigations of urban life and space” in the Middle East. You can read the interview here: enjoy! New Texts Out Now: Ralf Brand and Sara Fregonese, The Radicals’ City: Urban Environment, Polarization, Cohesion. While terrorism has shaped urban security in the last decade, since 2011 several cities worldwide have been at the centre of protest, riot, and even uprising. If terrorism was the key for understanding urban security in the past decade, is uprising is a crucial key for understanding urban security in the current one? On 26 September, 14 international and interdisciplinary speakers gathered for the IAS-sponsored workshop Responding to Uprising: Urban Security between Resilience and Resistance and debated the impact that protest and uprising have on urban security. The workshop considered the changing life in cities experiencing crisis and transition, both from the everyday perspective of communities and their spaces, and from the official perspective of the state and its security agendas. The speakers held presentations to an audience from across the University of Birmingham and conducted two briefing sessions in order to identify possible trends and agendas for research and policy. Disciplines and fields represented at the event included Geography, Law, International Sciences, Civil Engineering, and Resilience Studies. The workshop was international in nature and aimed to produce comparisons about urban responses to crisis across accepted regional divides like the MENA and the EU. •Which security discourses, tactics and policies do states adopt to respond to protest and uprising? •Which strategies do communities employ to respond, resist and adapt to crisis and transition? •Do state and community responses trust, reflect and respect each other’s objectives? •How are resilience and resistance understood, related and applied contextually? This extremely content-rich day of discussions spanned the themes of spatial configurations of security and resilience devised by the state and by other actors of coercion, the relationship of urban communities with constituent power (especially the police) and their coping mechanisms during uprising and transition. While context is important in thinking about uprising and protest and we should stay clear of overarching statements, it is also important to trace possible links between cities that are usually considered as part of different global regions, such as the EU and the MENA. Notice board outside Paternoster Square in the City of London. 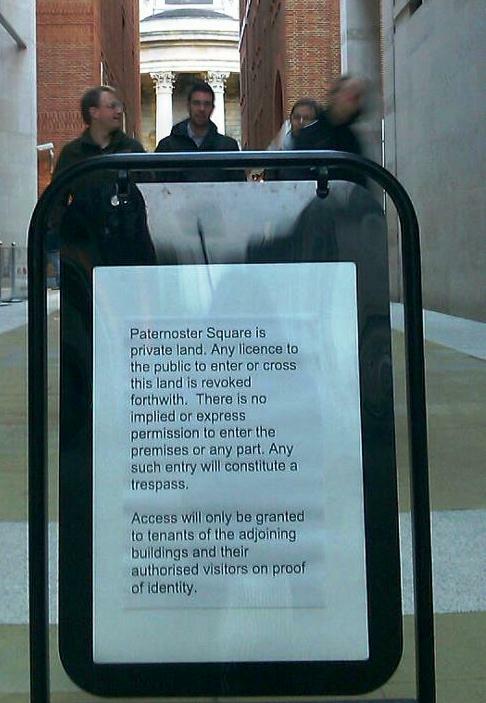 Access to the square was limited after Occupy London attempted to occupy it on 15 October 2011. The square is a public space but has no public right of way, so it can be closed by its owners at any time. Managing and rearranging urban space is a crucial part of state policing, for disciplining dissent and ‘disorderly’ environments. The case of the Arab uprisings and protests in Europe is not different, however what distinguishes it is an increasingly clear combined action by police (or army), law, irregular groups, and the private market – in different ways depending on the context – in rearranging urban space to exercise coercion and limit the possibility of protest. The languages and technologies mobilised for this purpose often used to be the realm of counter-terrorism, as suggested by Dr. Victoria Trimble. Blockades, checkpoints, and even separation walls, for example, are common practices used by the authorities in post-revolutionary Cairo. In London, corporate privatisation and legal mechanisms have also been employed to ‘map out’ the Occupy movement from Paternoster Square and the Saint Pauls’ cathedral precinct, as Prof. Antonia Layard demonstrated. The former was sealed off to the public, tightening its (flexible) status of quasi-private space; the latter was mapped as a highway using transport law, which established a corridor where encampment was illegal. The delegation of coercion during protest and uprising is another configuration of security that combines state, irregular forces and the private sector. Practices like the police hiring thugs and vigilantes, infilitrating protests, and the facilitation by the market of transnational police and military training, is posing serious questions about the State’s control of sovereignty in several countries like Egypt, Greece and Turkey. This opens questions about the state’s more or less strategic hybridisation with a range of irregular actors as highlighted by Dr. Sara Fregonese. Some of these contaminations, like the phenomenon of the ‘parastate’ in Greece, have longer historical genealogies, explained by Dr. Sappho Xenakis. However, their impact on urban spaces and communities deserves more research. One aspect linking the study of urban conflict and the study of protest is the tendency by many researchers to adopt state-centred, official- and media-based accounts of events. According to Dr. Gennaro Gervasio, this tendency shadows the everyday strategies of resistance of ‘marginal’, emerging subjectivities and spaces, often in peripheral localities, which are important to understand how protests and strategies of resistance are shaped. Urban space is crucial for resistance: by taking, occupying, reclaiming and reconfiguring spaces within cities, established power arrangements are subverted and resistance is made tangible. Reconfiguration happens also in notoriously destructive ways, such as the burning of historic buildings in Athens in December 2008. However, taking space is not a unique or novel feature of the present protests and the longer histories of occupation and reclaiming space need to be unpacked, argued Dr. Albet, in order to grasp the rationale of current protests. Importantly, it is the periphery of the megalopolis, as specified by Dr. Gervasio, where the urban communities of resistance develop, before the centre becomes the iconic and performative site of game-changing protests, like those of Tahrir Square. In times of austerity and transition, argues Dr. Xenakis, it becomes clear that urban security is for citizens rather than for other of the city’s dwellers – such as immigrants and slum dwellers. A striking case in question is that of street children – a particularly understudied subject, according to Nelly Ali’s poignant presentation – who despite their often conscious activism, have been the object of systematic violence by old, transitional, and new regimes. The youth is another crucial component of communities of resistance and the question of which role youth, and especially the post-Mubarak Egyptian youth, has to play in the changing public spheres of the MENA region remains an open question, says Prof. Michelle Pace. The technologies of repression used by the state or its associates are being counteracted by growing solidarity and organisation in resistance. This is particularly the case with the increasingly commercialised and widespread use of ‘non-lethal’ weapons such as teargas. Witnessing, collecting and archiving evidence of tear gas use for controlling dissent are becoming crucial to activists and urban communities caught up in gas, and various organisations – such as Bahrain Watch – are mobilising, explain Dr. Anna Feigenbaum and John Horne. Such forensic of teargas could and should be accompanied by a ‘zooming in’ into the presence and actions of state-delegated, irregular, or corporate coercion against protesters, argued Dr. Fregonese, through witness reports, collection of visual evidence and recognition of specific practices (clothing, signalling, use of specific technologies) adopted by irregulars. The workshop questioned the relationship between local urban communities and emerging national security practices and agendas for controlling (often violently) domestic civil dissent. It identified some outstanding and pressing issues about security and uprising in cities across different regions, revealing closer connections between them than commonly thought. Many thanks to the Institute of Advanced Studies (IAS) for supporting this event and especially to Sarah Myring for the practical organisation; to the speakers and chairs; and to Simon Copeland for note-taking during the event. What follows is the program of the day of discussions I am hosting at Birmingham on the theme of how to manage cities in times of uprising. There will be a wide interdisciplinary range of speaker, including Geography, Engineering, Law and Politics. The workshop is sponsored by Birmingham’s Institute for Advanced Studies and sees the participation of internal speakers from both my academic homes: the Institute for Conflict Cooperation and Security and the School of Geography, Earth and Environmental Sciences. Gennaro Gervasio Power and Resistance, and the Egyptian Revolution: a view from the margins. Group 2. From counterterrorism to counterprotest? Agendas, contexts, meanings, implementations. Sara Fregonese, Waiting for the spillover. Why reinforcing borders won’t strengthen Lebanon’s sovereignty and keep it out of conflict. – Cities, not borders, is where Lebanon’s sovereignty is at stake. – We need to account for Lebanon’s hybrid sovereign formations. – UK aid needs to move beyond quick-fixes and tackle Lebanon’s problematic relationship between the regular army and Hezbollah and the monopoly of political violence.